We visited NAFEM in Orlando last week and it was a fantastic show. Several of our global customers were showcasing their unique food and beverage dispensing machines. Each one has ground-breaking capabilities, enabled by our Quantex disposable range of pumps. 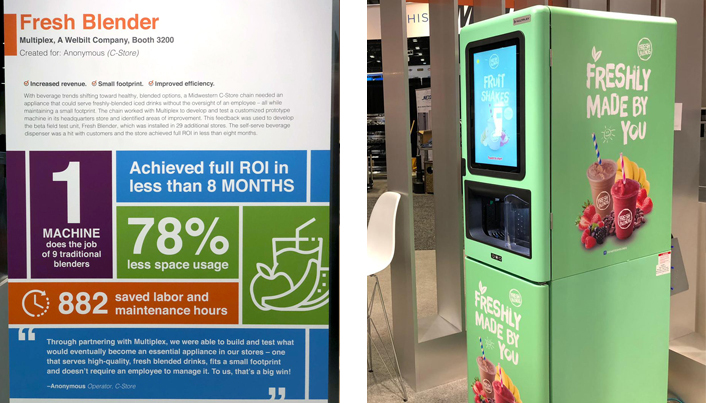 One of our customers, Fresh Blends® supported by Multiplex, was featured in NAFEM’s “What’s hot, what’s cool, what works” section and was (literally) causing a stir! Fresh Blends®’ frozen beverages platform has been tried and tested by all the major C store chains across the US over the past 18 months, and is on the verge of being rolled out by several global retail brands. This self-serve machine requires very little maintenance and manual cleaning. It self cleans automatically after each dispense and blending process. When a supply of product inside is finished, you simply swap out the empty bag and pump, and replace it with a new BIB (with its new Quantex disposable pump attached). Having a new pump on each product means that the pumps are completely reliable and accurate throughout the life of the pack, and the product remains sealed from contamination. The high vacuum capability of the pump provides better bag evacuation which means more servings per bag and less waste. We can also pump particulates up to 4mm with no damage, so purées can contain real fruit pieces, seeds and therefore, taste very authentic. The Fresh Blends® machine’s refrigerated cabinet houses 8 x 7.6 litre BIBs, with all natural, and preservative-free flavours ranging from strawberry, mango, banana, mixed berries purees, and lemonade, to yogurt, cold-brew coffee, chocolate, vanilla and caramel. 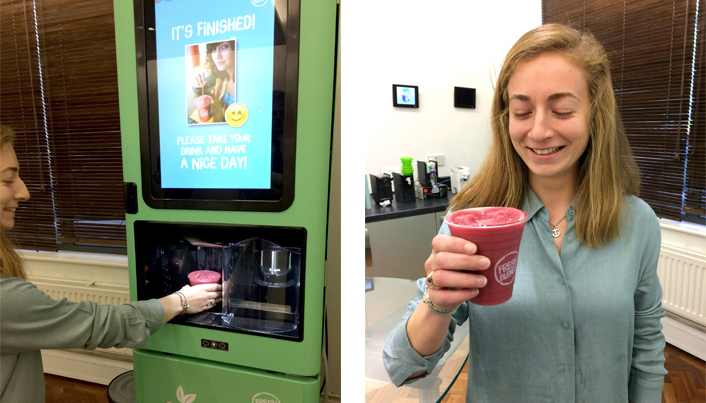 So, with combinations of 8 selected products inside the machine, and with the ability to blend ice in-cup, it is possible to create 600+ different recipes without any cross contamination! Examples of these will be real fruit smoothies, yogurt smoothies, drinks over ice, frappés, cold-brew coffee with different flavours, milkshakes, frozen chocolate combinations with fruit etc. Each machine reports to a cloud service, so retailers know how many products are sold, at what time of day, and which sizes, which is all valuable information for retailers. Operation receives real-time data about machine status, inventory levels, cleaning and sanitising, whilst event and error logs can be submitted to service tech teams in case of an emergency. 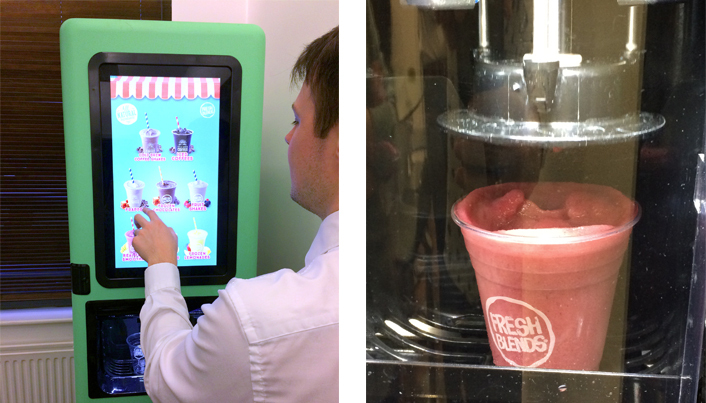 We are proud to have a Fresh Blends machine here in our London Quantex offices, which is being used for demos to European customers, so please contact marketing@freshblends.com to arrange a demo, or if you are interested in our Quantex range of disposable pumps, please don’t hesitate to contact us on info@quantex-arc.com.